For more than a decade since the 11 September 2001 terror attacks in the United States, western and regional powers have viewed Somalia from the prism of counterterrorism. State-building processes and political strategies have been dictated by the imperative of containing, countering and defeating Somali groups deemed to be or formally designated as terrorists. By dividing Somali political actors into two categories, extremists and moderates, this approach has produced a distorted understanding of the conflict and undermined the political and military effort to resolve it and rebuild the Somali state. The Life and Peace Institute project to explore Alternatives for Conflict Transformation in Somalia (ACTS) was conceived to address the distorting effect of the counterterrorism discourse. The report provides a snapshot of views, political positions and overall strategies of key Somali political actors during a particular period of six months since the election of the current federal government and adoption of the new provisional constitution in August and September 2012. It tried to capture the political views and strategies of major actors across the south central regions and Puntland. The report represents voices from the ground and relies on information gathered from primary sources. It is a contribution towards a better understanding of the intractable cycle of organised violence in Somalia. This report is not meant to confer legitimacy on any particular group or its ideology. 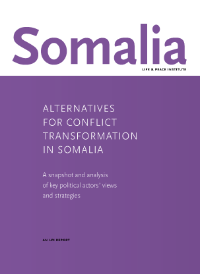 The Life & Peace Institute and its partner organisations in Somalia are working to develop a better understanding of domestic political actors and conflict dynamics so as to devise nonviolent conflict transformation strategies. This project is a first step in that direction. To read the entire report, download the document below.